I play bass for who I consider to be the best Elvis sound-a-like tribute in the UK (and probably the UK and Israel). I have already transcribed some of my favourite lines. I will put them on this blog in due time. It can be quite am interesting and sometimes shocking thing to do. Because I listen more carefully to the original recording I noticed things that I don’t usually play. Always On My Mind is quite a simple track to play, but delve a little deeper and the bass player (Emory Gordy) has some quite varied and and interesting rhythmic variations going on. This is a bass line I see many doing, yet they miss some of the more interesting parts. Click the link below for the pdf. On the introduction, there is a D being played, which I think is the bass. 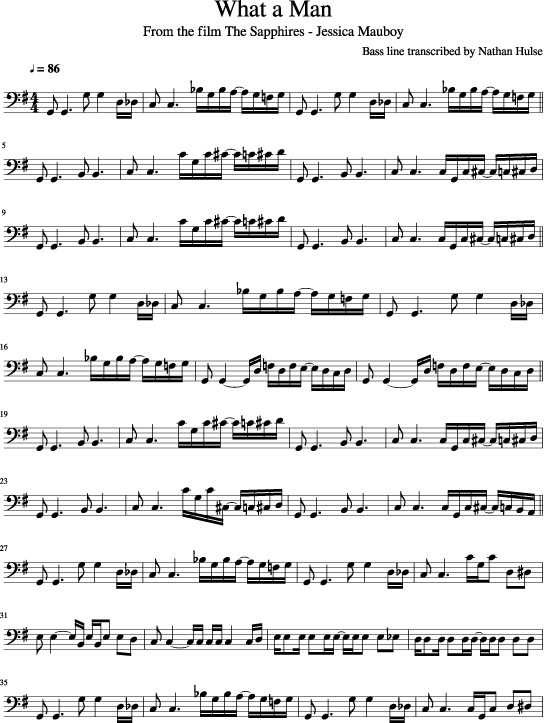 I’ve included the note in brackets as the main bass part you hear clearly starts on the fourth beat of the first bar. Emory uses quite a few slides which helps keep the line more interesting. In bar 10/11 he slide up to the B on the 9th fret, then back down on the G to the C. From playing this myself I would guess this helps the give the note more body. Bars 59-60 I have used the timing from the recording. However, in a live situation the singer would be more likely to go on feel. So listen to the piano pickup in bar 61. 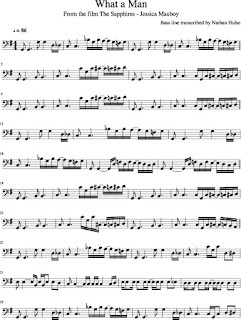 The final repeating bars, I’ve only transcribed the first time round, on the original recording it goes round about 6 times to the fade. Again, live, the singer would probably give a cue when to end. The YouTube clip features myself on bass with Lee Memphis King. Luckily, you can’t see me after the into. I would point out, I have done this transcription since the video, so it is interesting to see how much I didn’t pick out from the original recording. I’ve always enjoyed Wham bass lines. This particular track was originally played by Deon Estas, who used a status bass and Fender Jazz, not sure which he would’ve used on this recording. I used my Status Retro bass. I’ve written out the first verse accurately, there are some minor differences in the following verses. The Intro lines and chorus seem to be consistent throughout the track. It’s a relatively simple bass line and really effective which is why it works. During the fade out at the end you hear a nice little ad lib line which I included at the end of the transcription. I’ve used a bassless backing track for this. The only bass you hear is mine.